The Great Monday Give is here folks. 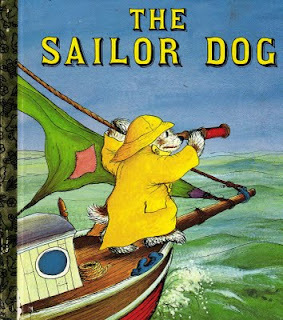 Today, I am giving away a like-new copy of The Sailor Dog. Not a vintage copy, but still a great read nonetheless. To be entered to win, simply comment on this post by midnight ~ Sunday ~ October 4. A winner will be selected at random the next am and announced shortly thereafter. As for last week, the winner of the Grimm/Babar combo is Jill. Congrats and e-mail me your mailing info to webe(at)soon(dot)com. Later all you peoples. This is one of my son's favorite stories! He would be thrilled to have his own copy. Enter me, please. My son would love this! This looks like a book my son would really enjoy. I so love MWB! I love her slightly quirky sentences and GW's illustrations just make it perfect. Thanks so much! I loved this story as a kid! Please enter me. My kids would probably too. awesome! !I don't know this one yet but it looks like something my kids would love. We'd love to have a copy of this book. Thanks for these fun give-aways and more generally for introducing me to so many wonderful books that I would have missed otherwise. I always look forward to seeing what you'll write about next. I stumbled across your blog a few months ago while trying to find information online about a particular title. While I love reading to my kids, I had no special interest in "vintage" kids' books at the time. Your site has actually generated that interest for me. I've tracked down many of your reviewed titles at the library and purchased several as well. You're providing a wonderful service! I've seen this but haven't had a chance to read it. Would love a copy for my girls. This looks like a great read! My son loves anything to do with boats right now. Thanks for the chance! This book looks really cute. Would love a copy for our home library. My husband said he wants this! Looks really cute. *LOVE* Sailor Dog!! Margaret Wise Brown & Garth Williams also did the wonderful "Mister Dog" which I heartily recommend. . . I've mentioned it before--my kids really like this one. Vintage or non, this would still be fun to read! My son would enjoy this immensely. I'm enjoying your blog. Hoping for beginner's luck in this week's drawing!